The Pilot Program at the Washington National Primate Research Center (WaNPRC) provides the specialized research facilities, expertise and limited support to investigators. In most cases, pilot projects are focused on unique or emerging research opportunities, requiring preliminary studies to generate scientific data that will lead to future expanded grant applications for independent funding. The Institute of Translational Health Sciences (ITHS) and the Center annually co-sponsor the Career Development and Ignition Awards. The awards support preclinical translational research in the areas of non-human primate models of human disease, drug delivery, transport, metabolism, and manufacturing. Fill out form at bottom of page to receive application. The Washington National Primate Research Center (WaNPRC) and the Institute for Translational Health Sciences (ITHS) are pleased to sponsor the Ignition Award pilot study program, focusing on the use of nonhuman primate models of human disease. The purpose of this award is to explore innovative areas of nonhuman primate (NHP) research and generate preliminary data to serve as a basis for submission of new research grant applications (e.g. R01-type grant to NIH or other funding agency) and/or subsequent clinical studies. There will be one or two awards. Applications should either have a primary focus on translational applications or a primary focus on the development or enhancement of the use of nonhuman primates as animal models. The WaNPRC intends to award one or two separate awards of up to $75,000 each. The award will be administered by the Primate Center and must be used for Primate Center study costs, including animal costs, per diem, procedures, supplies and salaries. This award is not intended to support outgoing subcontracts. This program is designed to support innovative studies utilizing resources within the WaNPRC. Nonhuman primates are the preeminent animal model of the human condition. This award program will facilitate use of NHP models and services of the WaNPRC and resources within the ITHS to provide information applicable to subsequent grant and/or clinical studies. This program will provide an opportunity to advance research programs developing and expanding the use of nonhuman primates in research of human diseases, also, by operating jointly with the ITHS, advance the translational process of development and use of therapeutics, diagnostics or device development. 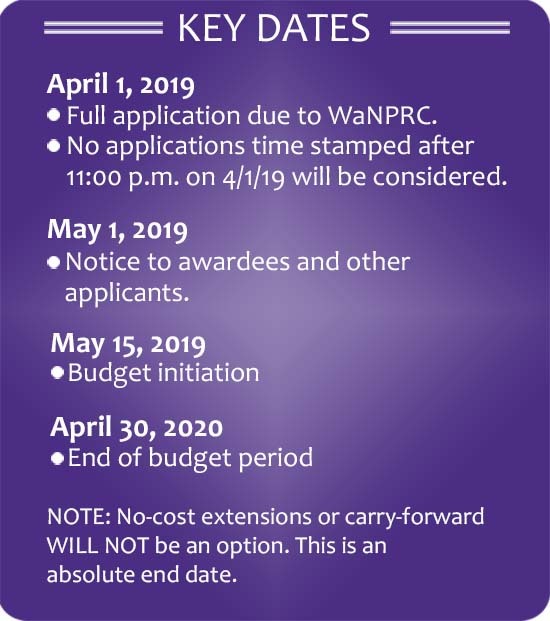 (email to pcgrants@uw.edu or via mail to Box 357330, Attn: WaNPRC 2019 Pilot Program). Applicants will be notified of their status by May 1, 2019. Applicants will receive a copy of the reviewers’ notes of their application. NOTE: The PIs receiving awards are responsible for securing approval from the UW Institutional Animal Care and Use Committee before a new project can begin. Budget period is anticipated to begin May 15, 2019 and must be spent by April 30, 2020. There will not be any option for a no-cost extension or carry-forward. Unsuccessful applicants may resubmit their applications for the next round up to a total of two (2) times. The Review Committee may deny the opportunity to resubmit an application if the reviewers determine the application does not meet the intent of the program. The combined Research Review Committee (RRC) for the Ignition Award applications will consist of members of the WaNPRC, and the ITHS Drug and Device Advisory Committee (DDAC). Members of the committee are selected to provide interdisciplinary insight into the proposed research. The committee is composed of core and affiliate scientists. If potential conflict of interest exists, ad hoc members will be appointed. If the committee does not feel the membership includes the necessary scientific expertise to provide an adequate review, an ad hoc reviewer will be added for that application. As needed, the WaNPRC will also invite representation from CoMotion for guidance on innovation represented by the technology. Applications will be critiqued and scored by the RRC. It is anticipated that the projects with the lowest score/highest priority will be funded. Based on funding levels, it is anticipated that two or three projects will be funded during this 2019 review cycle. Any research scientist or research faculty can apply except those who have received an ITHS/Primate Center Ignition Award within the previous three years. The Center particularly encourages applications from early-stage investigators and junior faculty. This is an opportunity to pursue innovative research projects or collect preliminary data that can provide proof of concept and lead into future funding. Applicants are encouraged to contact the WaNPRC [Courtney Miller (Grants & Contract Manager)] at: pcgrants@uw.edu to discuss the scientific components of their projects, WaNPRC resources available and general costs of the services to be provided. Complete budgets are required for the Full Applications. It is advised to develop the budgets in collaboration with the WaNPRC. The budgets for the NHP studies will be administered by the WaNPRC. All financial activity will be overseen by the WaNPRC Finance and Administration Office. No additional funds are necessary for indirect costs. The budgets associated with these awards are an allocation from the WaNPRC base grant and will be administered by the WaNPRC. No UW GC1 is required. It is expected that these applications and awards will not include any outgoing subcontracts. The WaNPRC requires an interim and annual report from all award recipients. The dates and specifications for these reports will be stated in the WaNPRC Notice of Award. Quarterly in-person meetings with a WaNPRC or an ITHS representative may be requested to track the progress of funded activities. The WaNPRC and the ITHS reserves the right to publicly disclose information about its granting activities. ITHS communications to the public may include lists of funded applications, the names of principal investigators and applicant institutions and departments, titles of proposed activities and reports about progress and outcomes. Please note that records produced at the University of Washington are subject to the Washington State Public Records Act, Chapter 42.56 RCW.